Last year, I tried a lot of recipes from other Indian cuisines that I haven’t explored. 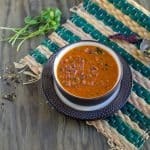 It’s interesting to find the similarities and how a few ingredients change the flavor and add that unique magic to the recipe. I tried quite a lot of recipes from Bengali cuisine last year but I posted only a few and here they are, Begun Bhaja, Jhalmuri, Rasgulla. 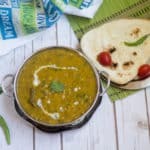 Cholar dal was one among the recipes that I tried and we fell in love with this dish instantly, especially vaandu. 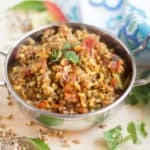 Cholar dal is a mild dal tadka prepared with Bengal gram dal or channa dal. We temper it with dry masalas and the addition of coconut, raisins, and cashews add a sweet tinge to this recipe. You can add either grated coconut or sliced coconut pieces. But I add both. 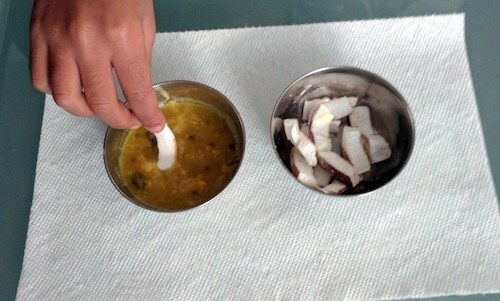 I add grated coconut during tempering and after cooking the dal I just add the coconut pieces. 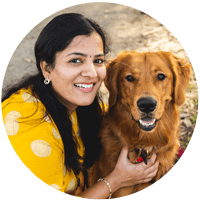 Vaandu loves those coconut pieces dipped in dal. Sometimes I need to set aside some coconut pieces for him to dip in the dal. He likes them for his snack too. Look at this picture below. This is how he prefers, one small bowl of dal and one small bowl of coconut pieces. I cannot miss this favorite recipe of vaandu in my blog. 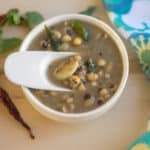 So here is the Instant Pot Cholar dal. As usual here is the quick IP formula. Saute mode + manual for 10 minutes (normal pressure release) . Wash and soak the channa dal till we do the tempering. If using fresh coconut, grated and slice the required amount. If using frozen, thaw the coconut to the room temperature. Slit the green chilly into two. Set your Instant pot in saute mode and add 1 tsp of oil. Once the oil is hot, add the cumin seeds,hing, green chilly, green cardamom, cloves, cinnamon pieces, chopped ginger, bay leaf, raisins, cashews and dried red chilly and saute for a couple of minutes. Then add 2 tbsps of grated coconut and saute for a minute. Now add the soaked channa dal, turmeric powder, sugar, salt and 2 cups of water. Mix well and set the IP in manual mode for 10 minutes. Once done, let the pressure release normally. After opening the IP, mash the dal nicely. 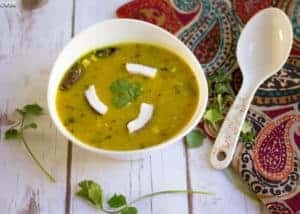 Garnish with cilantro and coconut slices and serve hot with rice or roti. Traditionally golden raisins are used. But as I had brown ones, I went with that. Either grated coconut or sliced coconut can be used. As kiddo likes coconut, I add both slices and grated ones. This is comparatively a mild and sweet dal. But adjust the spices, salt, and sugar as per your preference. 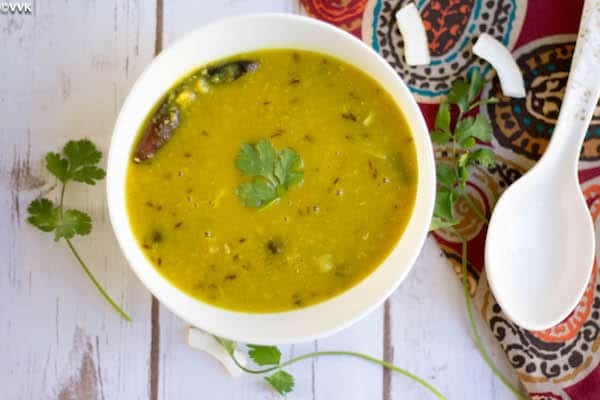 Bengal gram dal is typically used but you can replace it with toor dal, masoor dal or other dals of your choice. 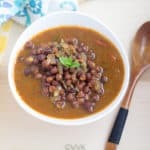 A simple mild Bengali style cholar dal or bengal gram dal prepared in instant pot. Once the oil is hot, add the cumin seeds,hing, green chilly, green cardamom, cloves, cinnamon pieces, chopped ginger, bay leaf, raisins, cashwes and dried red chilly and saute for a couple of minutes. You are very talented Vid…Your video is so perfect , didn’t notice it before…How many videos have you uploaded o far ? All the very best ,Vid…. errr… thanks pa. So far uploaded 5.. I have a page for that. You can check them out. Once again thanks. Will definitely check your videos Vid…All the best..